SAN FRANCISCO — Democrats Gavin Newsom and Antonio Villaraigosa are running a close race among likely voters in the gubernatorial primary. Senator Dianne Feinstein continues to lead fellow Democrat Kevin de León, state senate president pro tem, by double digits. However, many voters in both primary contests are undecided. These are among the key findings of a statewide survey released by the Public Policy Institute of California (PPIC). Newsom (23%) and Villaraigosa (21%) are the top two candidates in the June primary for governor, with 24 percent of likely voters undecided. Fewer would vote for Democrat John Chiang (9%), Republican Travis Allen (8%), Republican John Cox (7%), Democrat Delaine Eastin (4%), or Republican Doug Ose (3%). Results were similar in December, before Ose entered the race, with Newsom (23%) and Villaraigosa (18%) in the lead. Today, Newsom and Villaraigosa are tied at 32 percent each among Democratic likely voters. Among Republican likely voters, Allen receives 24 percent and Cox 20 percent, with 35 percent undecided. Among independents, Newsom gets 24 percent and Villaraigosa 17 percent, with 35 percent undecided. Nearly half of Latino likely voters (48%) support Villaraigosa. “Two Democrats are in a virtual tie in the top-two gubernatorial primary. But a quarter of likely voters are undecided—as many as support either of the front-runners,” said Mark Baldassare, PPIC president and CEO. Most likely voters (54%) are satisfied with their choice of candidates in the gubernatorial primary. But there are strong partisan differences: 71 percent of Democrats are satisfied, compared to 38 percent of Republicans and 44 percent of independents. Only about a third of likely voters say they are following news about the gubernatorial candidates very closely (7%) or fairly closely (23%). Before being asked about the primary election, likely voters were asked for their impressions of the gubernatorial candidates. They were given each candidate’s name and commonly used title because official ballot titles have not yet been announced. While 40 percent have favorable opinions of Newsom, California’s lieutenant governor, and Villaraigosa, former Los Angeles mayor, majorities say they have no opinion or have never heard of Allen, Chiang, Cox, Eastin, or Ose. Villaraigosa’s favorability rating among likely voters is up slightly from December (40% today, up from 31%). As Dianne Feinstein seeks a fifth term in the US Senate, she leads de León (46% to 17%), with a third of likely voters (33%) undecided. (The PPIC survey includes only candidates with significant news coverage and resources.) Two-thirds of Democratic likely voters (67%) support Feinstein, 19 percent support de León, and 13 percent are undecided. With no prominent Republicans in the race, about two-thirds of Republican likely voters (65%) are undecided. Among independent likely voters, 41 percent favor Feinstein, 16 percent favor de León, and 39 percent are undecided. Feinstein leads de León by double digits across regions and racial/ethnic groups, and among men (39% to 16%) and women (51% to 18%). A majority of likely voters (52%) have a favorable opinion of Feinstein (38% unfavorable). A majority also say they either have never heard of de León (45%) or don’t know enough about him to have an opinion (19%). Just 16 percent view him favorably (19% unfavorably). Which qualification is more important in a candidate for statewide office: experience as an elected official or experience running a business? A solid majority of likely voters (62%) prefer experience in elected office. This is a high mark in PPIC surveys and a notable increase from December 2015 (49% elected office, 43% running a business) and September 2010 (44% elected office, 43% running a business), when Jerry Brown and Meg Whitman vied for the governor’s seat. Partisans are sharply divided on this question: 84 percent of Democratic likely voters prefer experience in elected office and 65 percent of Republican likely voters prefer experience running a business. Independents are more likely to prefer experience as an officeholder (56% to 36%). Across all racial/ethnic groups and regions, majorities of likely voters prefer experience in elected office. Likely voters ages 18 to 34 are more likely than older voters to express this view (76% 18 to 34, 59% 35 to 54, 57% 55 and older). When choosing a statewide leader, such as governor or US senator, 60 percent of likely voters say a candidate’s stands on the issues is the most important qualification, while 17 percent say a candidate’s experience, 16 percent say a candidate’s character, and 6 percent say a candidate’s party affiliation. Likely voters are divided (47% favor, 48% oppose) when asked whether they favor repeal of the recently passed increase in the state gasoline tax, a measure that could be on the ballot this fall. Majorities of Republican (61%) and independent (52%) likely voters favor repeal, compared to 39 percent of Democratic likely voters. Likely voters are also divided about the idea of easing the strict limits on commercial property taxes imposed by Proposition 13. A proposed measure would tax commercial properties according to their fair market value but not lift Proposition 13 limits on residential property taxes—creating a “split roll” tax system. While 46 percent favor the idea, 43 percent are opposed and 11 percent don’t know. Support for this proposal is at its lowest point among likely voters since PPIC began asking about it in January 2012 (60% in favor). Today, a majority of Democratic likely voters (53%) are in favor, compared to 45 percent of independent and 34 percent of Republican likely voters. Support is similar among homeowners (47%) and renters (44%). Californians name immigration as the most important issue for the governor and legislature to work on this year (20% all adults, 23% likely voters). Other issues are named by less than 10 percent of residents (9% jobs, economy; 8% education, schools, teachers; 7% state budget, deficit; 6% infrastructure). Immigration is the most frequently named issue across the state’s major regions and across partisan groups (28% Republicans, 20% Democrats, 18% independents). The survey—taken just after California became a sanctuary state on January 1—asked whether the state and local governments should make their own policies and take action separate from the federal government to protect the legal rights of undocumented immigrants in California. Majorities (65% adults, 58% likely voters) are in favor. Partisan divisions on this question are stark (83% Democrats, 53% independents, 21% Republicans are in favor). Majorities across regions and age, education, income, and racial/ethnic groups are in favor. Overwhelming majorities (85% adults, 81% likely voters) favor the protections given by DACA, the Deferred Action for Childhood Arrivals program, to undocumented immigrants brought to the US as children. Majorities of state residents across parties, regions, and demographic groups favor the program, which President Trump has announced will end. “Californians across regions are most likely to name immigration as the top issue facing California today, and majorities across party lines are in favor of the DACA protections,” Baldassare said. Nearly half of adults (46%) are closely following news about sexual harassment and misconduct in the legislature. Likely voters are even more likely (59%) to be following news of this issue —much larger than the percentage following news about the gubernatorial candidates (30%). Californians are divided in their views about how Democratic leaders in the legislature are addressing sexual harassment (39% adults approve, 36% disapprove; 38% likely voters approve, 38% disapprove). Democrats (52%) are far more likely than independents (28%) or Republicans (18%) to approve. Women and men have similar views: 40 percent of women and 38 percent of men approve of Democratic leaders’ handling of the issue. “Many Californians are closely following news about sexual misconduct in the state legislature, and they are divided about how Democratic leaders are handling this issue so far,” Baldassare said. 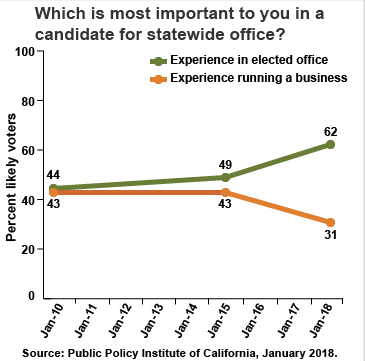 As Jerry Brown begins his final year as governor, 56 percent of adults and 57 percent of likely voters approve of the way he is handling his job. An overwhelming majority of Democrats (76%), nearly half of independents (47%), and a quarter of Republicans (26%) approve of the governor’s job performance. About two-thirds of Californians (67% adults, 66% likely voters) approve of the governor’s budget when they are read a brief description of the plan, which projects a one-time surplus and would bring the rainy day fund to 100 percent of its constitutional target. Strong majorities (70% adults, 65% likely voters) favor the governor’s proposal to spend $4.6 billion from the recently passed gas tax and vehicle fees to repair roads, highways, and bridges; improve commute corridors; and improve local rail and public transit systems. Half of Californians (51% adults, 50% likely voters) approve of the job the legislature is doing. Most Democrats (69%) approve, while far fewer independents (37%) and Republicans (24%) express support. Will the governor and legislature be able to work together and accomplish a lot in the next year? Most (60% adults, 58% likely voters) say yes. Trump and the US Congress will be able to work together and accomplish a lot in the next year. At the close of the president’s first year in office, his approval rating in California is 26 percent among adults and 32 percent among likely voters. A strong majority of Republicans (72%) approve of the president’s job performance, while just 31 percent of independents and 7 percent of Democrats concur. Congress’s approval rating is lower than the president’s: 21 percent among all adults, 15 percent among likely voters. Negative views of Congress are held across parties: just 27 percent of Republicans, 18 percent of independents, and 10 percent of Democrats approve of the way the Republican-led Congress is doing its job.